The School House at St Andrew's, Brighton is historically and architecturally significant, it is also significant within the ‘school of Zest Cafes’, housing 2 of our finest Espressist Blends (Composition VII & Blackbird) along with circulating Zest micro-lot and single origin filter roasts that are brewed to perfection and served alongside a gastronomically reverent menu. Displayed at the entrance of the café is a sign reading “Class Of 1843”, a nod to the birth of the structure. Class indeed. The building itself oozes class, one of the few surviving examples of architect Charles Webb's distinctive Melbourne institutional buildings (others include Melbourne’s regal Royal Arcade & Windsor Hotel, among many other Victorian churches). Originally built as a part of the Church Of England St Andrew’s Precinct consisting of a graveyard (1843), school house (1857), church (1857 and 1962), parish hall (1925). The precinct was constructed in 1843, but in 1850, the original church was demolished and Charles Webb, a local parishioner and prominent architect of the time, was commissioned to rebuild the church in addition to a schoolhouse, using the remarkable ironstone from the original church building. As it stands today, the Ironstone H-shaped Schoolhouse building reflects its history with schoolhouse references throughout. Most prominently, a mural on one of the walls of two children playing which reads “Forever Learning,” an axiom we at Zest relate to. 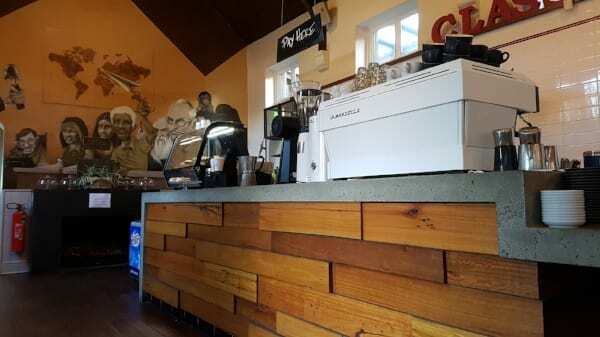 The ever-changing specialty coffee industry certainly evokes such a feeling. Brighton Schoolhouse (BSH) Café is huge, but somehow still feels cosy. There are two rooms off the main entrance. 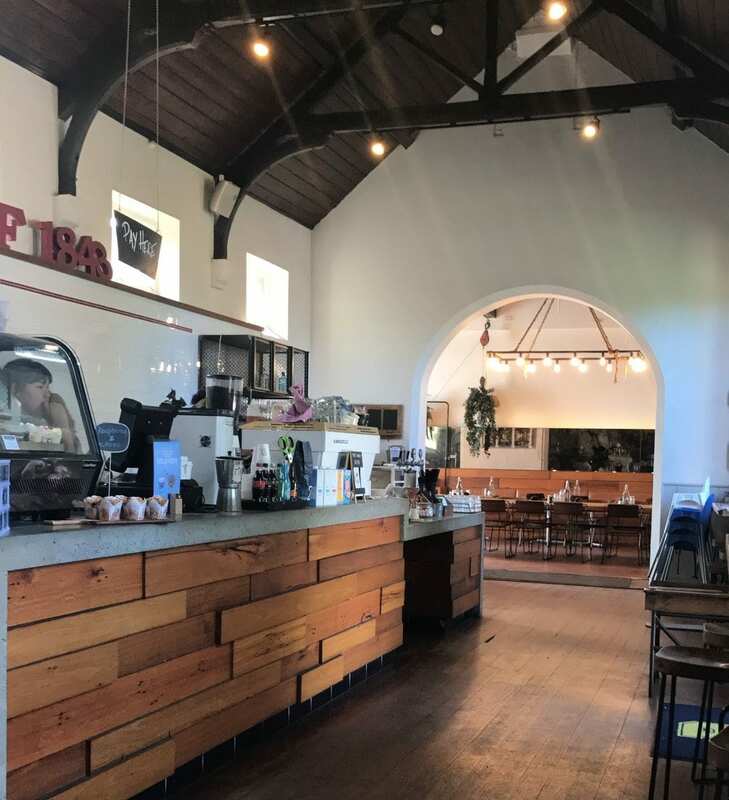 The smaller of the two, accommodating a huge communal table with pew-style benches plus a smattering of vintage school desks, complete with colouring pencils – the perfect place for an after-school treat. The space boasts just enough indoor greenery to bring the outside in, and if that’s not enough, the cathedral style windows bring in the rest – shooting natural light into every corner of the room. Speaking of light, a low hanging chandelier and huge antique clock on the wall add a further touch of class. The windows in every room of the Schoolhouse overlook the outdoor courtyard, on the Church Street frontage. The courtyard (though almost as big as a schoolyard) is ample and serviced by a second coffee machine in busier times. The main room, to the right of the entrance is grand. Another communal table dons the centre of the room, seating up to 16, 20 if you squeezed in (think, the most amazing brunch-party you could imagine!) And around the room, several tables of 4-6, plus couple of higher tables with stools if you’re seeking a clear view into the gardens. Gorgeous wooden tables are crafted by local artist Mark Tuckey, and wall décor by Susan Bradfield, reflecting grand European buildings of similar epicness as the BSH building. Again, this room is bordered by huge cathedral windows, throwing light in a heavenly vibe onto your brunch. The baristas at BSH are second to none. Slinging lattes with ease – every one complete with the cutest latte art. 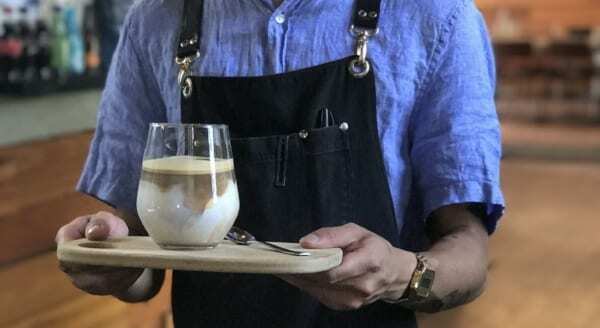 Upon their suggestion they will serve the milk coffees with our Blackbird blend (Colombia, Ethiopia, Brazil) and save the CompositionVII blend (Ethiopia, Kenya) – which is a great recommendation, but don’t be afraid to mix it up (I personally dig the CompVII as a milky coffee – bright and fun). They also offer some manual brews for the aficionados. 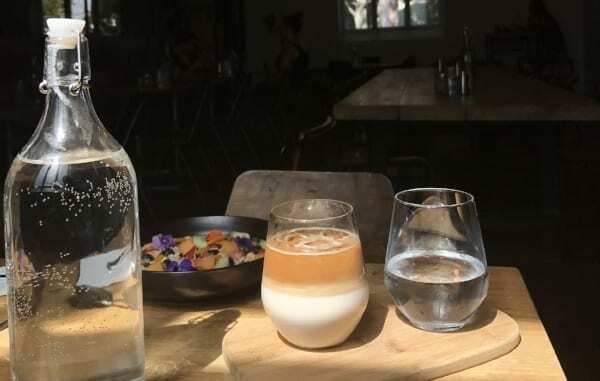 They’re not afraid to step aside from the LaMarzocco for a moment to brew a Zest micro-lot in a V60 or Aeropress, and also offer cold brew in the warmer months. Bookings available for up to 25, but fear not if you don’t have a booking, Brighton Schoolhouse caters for 300. I know, it’s huge – but it feels cosy. 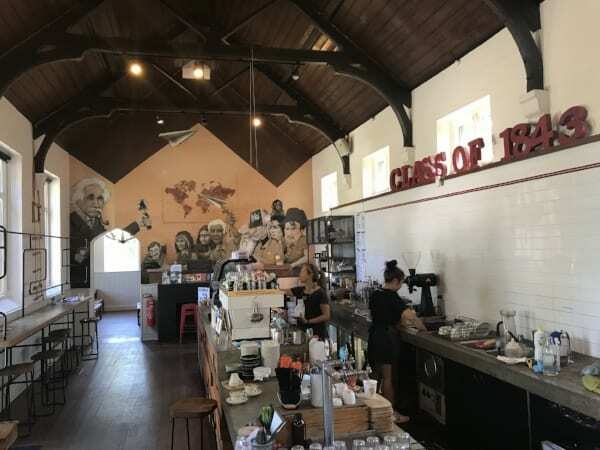 If you haven’t been to the historic Brighton Schoolhouse yet, and you live in Melbourne, get there. You honestly can’t imagine the magic of this establishment until you see it (and taste it) with your own eyes (and mouths). Tell ‘em Z sent you !